I used one of the newest Pure Innocence images today. This one is called PI Freckles! I paired her with paper from the Pink Paislee London Market collection. I also used a few Die-namics on my card, including the new Large Royal Rose Die-namics (my rose is made out of some mauve felt). Here's a look at the MFT Wednesday sketch #70 that I used. All of the challenge details are in the MFT SCS forum, here. Accessories: Die-namics: Large Royal Rose, Crown Border, First Place Award Ribbon (My Favorite Things); Standard Circle Nestabilities (Spellbinders), Felt, Twill Ribbon, Twine (May Arts), Foam tape, Thread, Sewing machine. My favorite PI to date! LOVE this card, Steph! So cute! I'm so happy you are all feeling better in your household Stephanie! 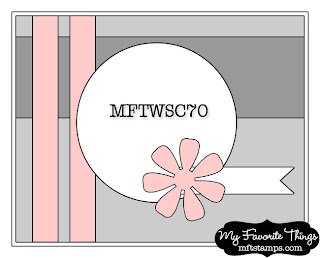 I can see you have your crafty MOJO in full force ;) This card is darling! 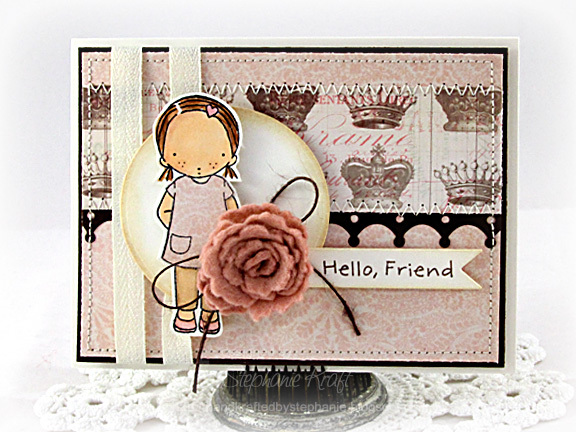 Love the mix of stamps and DP! That flower is so beautiful! Sorry to hear you all were not feeling well. There is a lot of stomach flu going around town here.